The tax laws for rolling over or transferring funds into a SIMPLE-IRA changed as of December 18, 2015. A person who is a SIMPLE-IRA participant, whose employer first made a SIMPLE-IRA contribution more than 2 years ago and who is eligible for a 401(k) distribution is now authorized to take a distribution from the 401(k) plan and directly rollover or rollover such funds into the SIMPLE-IRA. The tax rules now also authorize an individual to take a distribution from his or her traditional IRA or SEP-IRA and to transfer or rollover such funds into his or her SIMPLE-IRA. The individual must have met the 2 year rule applying to the SIMPLE-IRA plan. Presently you may have some customers who have both a traditional IRA and a SIMPLE-IRA because the tax laws required this prior to December 18, 2015. No longer, if the individual has met the two year rule, then the traditional IRA funds may be merged into the SIMPLE-IRA. This law change means an IRA custodian should be using updated rollover, transfer, and SIMPLE-IRA plan agreement forms. SIMPLE-IRA amendments should be furnished. We expect (and hope) the IRS will soon be revising its model SIMPLE-IRA Forms (5305-S and 5305-SA) as these forms expressly provide that it is impermissible to contribute funds to a SIMPLE-IRA arising from a traditional IRA or a 401(k) plan. Until then, an amendment should be added to such forms authorizing such rollover, direct rollover and transfer contributions. 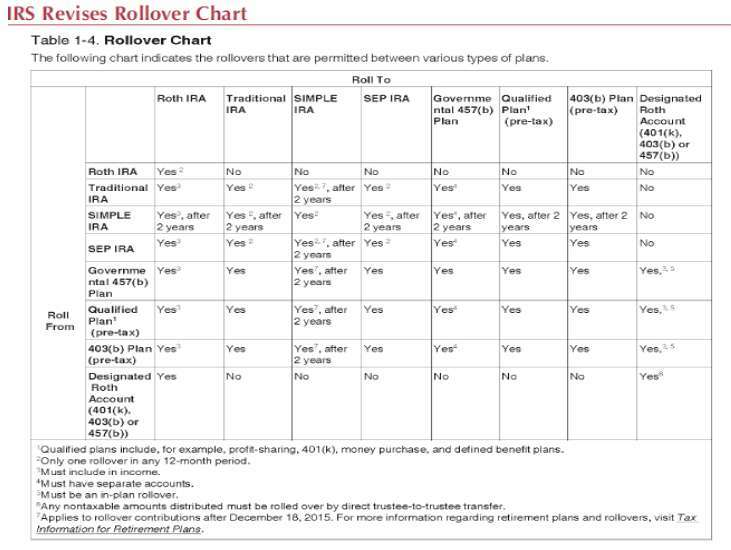 The IRS has revised its IRA Rollover Chart showing the new rollovers applying to SIMPLE-IRAs. Roth IRA funds are only eligible to be rolled over to another Roth IRA. They are ineligible to be rolled over to any other type of IRA or any qualified plan, 403(b) plan or governmental 457(b) plan, including a Designated Roth account. SIMPLE-IRA funds may be distributed and rolled over into any other type of plan only if such rollover occurs after the 2-year holding requirement has been satisfied. Funds within any of the 4 types of IRAs are ineligible to be rolled over in a Designated Roth account within a 401 (k) , 403 (b) or 457 (b) plan. Funds within a qualified plan, 403(b) plan or governmental 457 plan may be rolled into a Designated Roth account within a 401(k), 403b) or section 457b only if done as an in-plan rollover. Such distribution amount is includible in income. Designated Roth funds may be distributed and rolled over into a Roth IRA or they may be transferred into a Designated Roth account within a different plan. That is, Designated Roth funds cannot be withdrawn and then rolled over by the participant. Observe that there are some special rollovers not discussed by the IRS chart. b. Direct rollovers by both spouse beneficiaries and non-spouse beneficiaries. Jane Smith wishes to make a SEP-IRA contribution for herself. Jane is a self-employed horse rider/exerciser. She had a good year and so she wants to establish a SEP and then make a $26,000 contribution to her SEP-IRA for tax year 2015. What forms will she need to prepare? First, as an employer (a one person business), she must establish her Simplified Employee Pension Plan (SEP). She will do so by completing and signing the IRS model form 5035-SEP. Note that she signs the form as the “employer.” The financial institution does not sign this form. Jane will either obtain this form from her accountant, attorney, financial institution or she will find it on-line at the IRS website, www.irs.gov. Second, as the employer, she will write a business check for the amount of $26,000 and she will contribute it to her SEP-IRA. A SEP- IRA is established by a person establishing a standard traditional IRA (IRS model form 5305) and then making a SEP-IRA contribution to it. For 2015 she is permitted to make a SEP-IRA contribution equal to the lesser of 25% of her adjusted business earnings or $53,000. We recently had a call from an IRA representative where the IRA software system her bank was using did not make this clear. The system gave the idea that the only form needed was the Form 5305-SEP. The system did not make it clear that the individual either needed to have an existing IRA into which the SEP-IRA contribution would be contributed or a new SEP-IRA must be established. Both forms are needed and so hopefully the vendor will change its system once it is advised that a clarification is needed. IRS statistics show that annual SEP-IRA contributions exceed those of annual traditional IRA contributions. A financial institution will benefit by communicating with its business customers about the benefits of SEP-IRAs. The tax laws do not require a person who has an existing traditional IRA to set up a new SEP-IRA. Some financial institutions choose for administrative reasons to require a separate IRA, but the tax laws do not require it. If any employee would fail to have a SEP-IRA so the business did not make a SEP contribution for such employee, there would be no SEP and the expected tax benefits would not apply for the sponsoring business and other employees. In summary, establishing a SEP is easy as long as the two steps above are completed for a one person business and the three steps are completed for a business with employees. The IRS last revised the model IRA Forms 5305, 5305-A, 5305-R and 5305-RA in March of 2002. Since then there have been numerous tax laws enacted with IRA changes. The IRS has given no written explanation as to why the IRA forms have not been amended. We have asked a number of times when the IRS would be revising their IRA forms, but to no avail. It is not a good thing that the IRS has not updated their forms. When is it necessary for an IRA custodian/trustee to fu rnish an IRA amendment? Is it necessary or required to furnish one in 2016? Each institution must make its own determination because one needs to understand when was the IRA agreement last amended and how is it being amended. A primary question is, “when is the last time the financial institution furnished an amendment?” What do the current IRA plan agreements provide? Are there some IRAs set up with one certain plan agreement and others with a different plan agreement? One may learn a tax lesson the hard way, if he or she adopts the position that an amendment is not required because the IRS has not said one is required. One must remember that the IRS has already stated in its governing IRA regulation (1.408- 6 (d) (4) (ii) (C) ) when an IRA amendment is required. The regulation must be followed until the IRS revises it. There are two types of amendments – one which amends the IRA plan agreement and one which amends the IRA disclosure statement. Regulation 1.408-6(4)(ii)(C) requires that an IRA amendment be furnished no later than the 30th day after the amendment is adopted or becomes effective. The general rule in the governing IRA regulation is – a law change is enacted which impacts a provision found in the IRA pl an agreement; the provision will be amended to implement the law change and the amendment will need to be communicated to the IRA accountholder or inheriting beneficiary. When the IRS revises its model IRA forms, the amendment is considered to be mandatory or required. When a non-IRS change is made in the plan agreement by the financial institution (or the IRA vendor), the change may either be mandatory or not. Mandatory changes deal with the tax code changes. For example, CWF has amended the Roth IRA plan agreement so that any person with funds in a traditional IRA is eligible to convert some or all of these funds to a traditional IRA even though he or she may have MAGI of more than $100,000. The IRS has not yet amended its model Roth IRAs (Forms 5305-R and 5305-RA) to remove the $100,000 restriction. And the IRS has not given any guidance as to whether or not a conversion done in 2010 or later qualifies or doesn’t qualify since Form 5305-R and 5305-RA state that the custodian/ trustee may not accept a conversion contribution if the person has a MAGI greater than the $100,000. The standard IRS rule for IRAs/pensions has always been - the plan document must authorize the action. For this reason, even though the IRS has not amended the Roth IRA forms, CWF has. A long time ago (1986/1987) the IRS acknowledged that there are tiimes that even though the IRA plan agreement has not been changed, a disclosure statement amendment must still be furnished. Example, when the deductible/nondeductible rules were first authorized in 1986/1987, such rules did not require the IRA form to be rewritten because the IRA form discusses the maximum contribution amount limit, but does not discuss the deductible/nondeductible rules. The IRS stated there needed to be a disclosure statement amendment discussing or explaining the deductible/nondeductible rules. We at CWF have revised our IRA plan agreement forms and written the 2015-2016 IRA amendments to include the following revisions. New 2016 limits impacting tax deductions and the Savers Tax Credit. Improved discussion of the reporting to be done by the IRA custodian to the IRA accountholder and by the IRA accountholder or beneficiary to the IRS. New improved discussion of direct rollover option and rollover option for distributions from 401(k) and similar plans into a traditional IRA and/or a Roth IRA. IRS rules effective as of January 1, 2015 made it easier to move 100% basis into a Roth IRA. In summary, answering a question whether or not an amendment is required is not simple. Each financial institution will need to make its own decision to furnish one or both amendments. It is true that the IRS has not been very active in auditing whether or not IRA custodian/trustees are furnishing IRA amendments as required by the IRA regulation. We at CWF believe it is in the best interest of a financial institution to furnish the amendments. The governing IRA regulation provides that a $50 fine may be assessed an institution for each time it fails to furnish the IRA plan agreement and $50 each time it fails to furnish the IRA disclosure amendment.